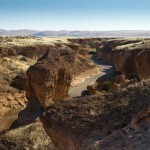 On the way to Sossusvlei approximately 6 kilmoteres from the park entrance is the Sesriem Canyon. The Tsauchab river hollowed about one kilometer long and 30 meter deep gorge into the rock. 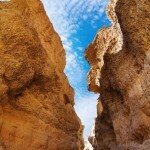 The canyon is said to be caused by a continental shift two to four million years ago in the 18-million year old rocks. Previously settlers pulled buckets filled with water up from the depths with six knotted belts. 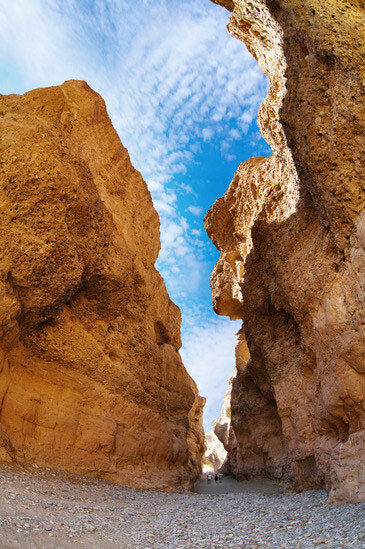 Therefore, the canyon was named after the Afrikaans word “Sesriem” meaning “six belts”. Above the canyon there is a car park from which visitors can descend into the ravine via a small path. In especially hot weather, when the sun is high in the sky, the narrow meter wide gorge sheds pleasant cool shade from above. The light that does cascade through the cracks creates impressive shadows on the steep rock walls. The river bed is nearly almost dry with only a few water-filled pools that are used by the animals as watering holes. When you walk through the gorge you are met by an idyllic pool, perfect for a refreshing swim. The small pools are filled after the rainy season and it is spectacular to see the fresh glistening water. 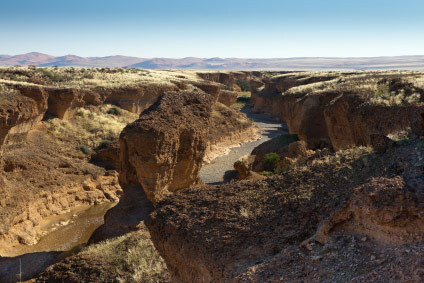 The canyon wides, flattens and empties out into a shallow river bed that leads into the Sossusvlei inside.